As the use of digital technologies becomes a greater part of our everyday lives, it becomes more important to equip learners with the skills they need to go beyond being consumers of digital content to actually creating and producing their own digital solutions. Coding offers a great opportunity for learners to develop technical skills along with logic and problem-solving skills, while also offering the chance to have fun and create. OSMO Coding is a fun and simple introduction to the logic of coding in the form of a game. The player uses code to direct an animated character Awbie through a series of obstacles, collecting strawberries along the way. 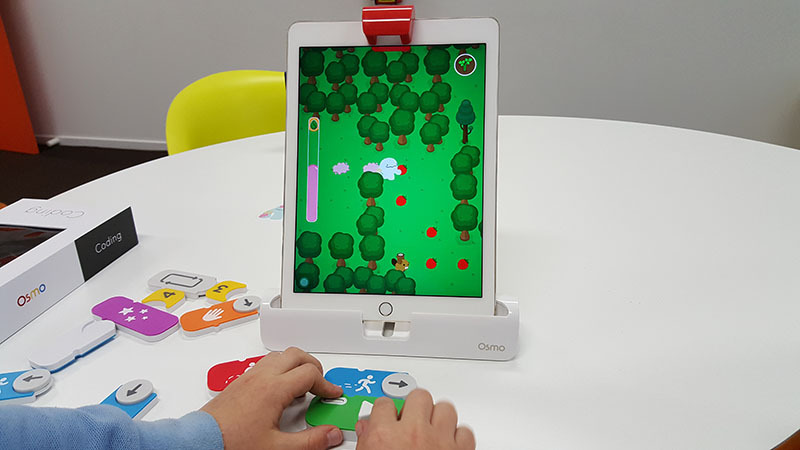 OSMO Coding uses the iPad’s camera to view physical blocks which the user places in front of the iPad. Each block represents a different element of code – a block to make Awbie walk, another to make him jump, etc. By placing the blocks in sequence, then pressing a button to start the operation, the player instructs Awbie on his way through the game’s mazes. It’s a fun and engaging introduction to the logic of coding, with the game providing a structure for beginning coders to follow and develop the logical processes they’ll use in their future coding activities. Blue-Bot is a small, simple floor robot which can be programmed to follow a path using the direction buttons on its back. Guiding Blue-Bot on its path requires the user to think about direction, orientation and how to sequence instructions. 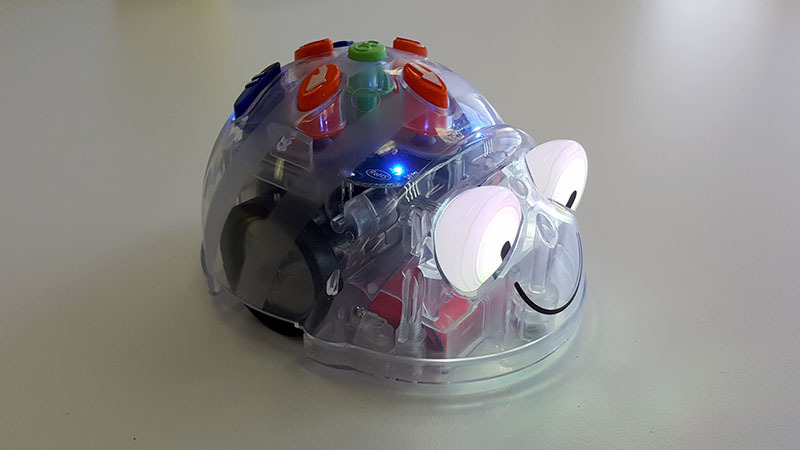 Blue-Bot can also be connected via Bluetooth to tablet apps to expand the possibilities of how it can be used. Directing Blue-Bot through the app allows the user to see their sequence and edit it, as well as offering further control options. The ability to choose between these levels of difficulty makes Blue-Bot adaptable to the differing needs of beginning programmers. While making Blue-Bot go is a fun activity in itself, it also presents users with the opportunity to create their own challenges for Blue-Bot (and its programmer) to overcome. 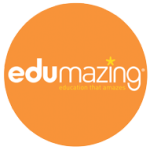 Creating mazes or courses for Blue-Bot to navigate is a great way to integrate coding with other areas of learning such as mapping. 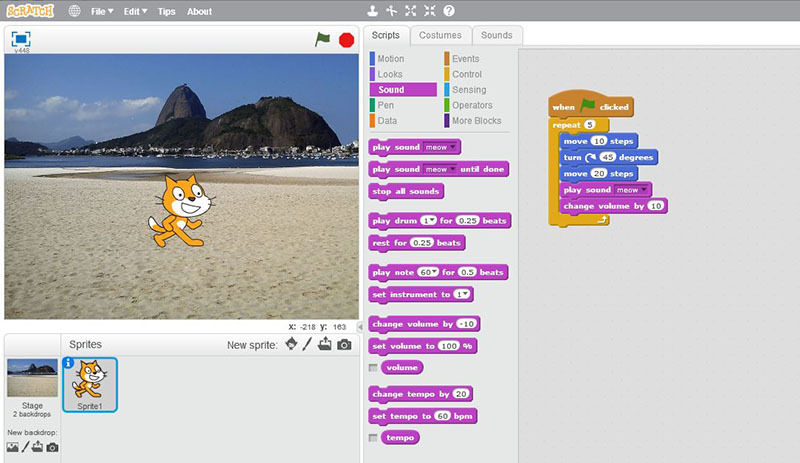 Scratch also includes a library of visual and audio elements which can be utilised, as well as the option of adding your own. This gives users a sandbox to play in where they are free to take Scratch in any direction they like. With so many possibilities, users can experiment and choose their own path, encountering and solving problems on the way. 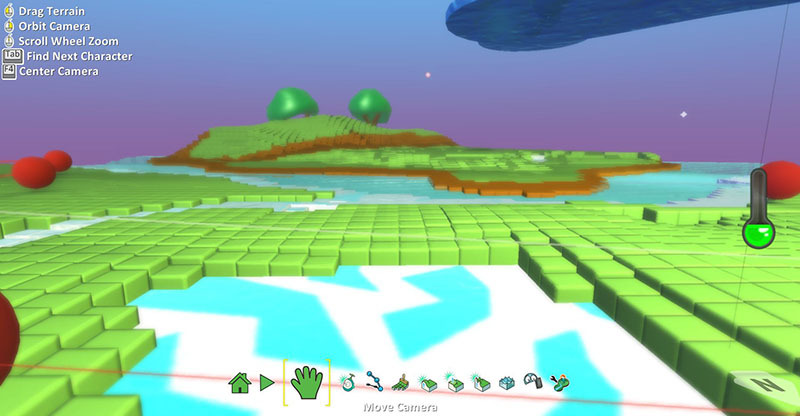 Kodu is a visual programming tool which allows users to work in three-dimensional worlds. It uses clickable menus in place of written code, giving users powerful options without requiring the more technical knowledge of coding languages. While options are limited to those offered in the menus, the possibilities of how to use these options throughout the worlds users create provides an open world of exploration and experimentation. Like Scratch, Kodu encourages users to think in terms of how one choice will impact upon another – “if this happens, then this will happen next”. This kind of sequential logic is a key part of how programmers think in any language, and Kodu provides a great way to develop this approach. Skills developed in the programming languages offered by Codecademy are able to be applied in real situations applicable to a range of devices, from developing web pages to apps and more. Codecademy connects its users to these applications by offering modules directed towards specific goals. 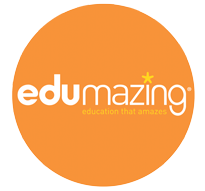 It’s a valuable resource supporting users to build on their learning and go further.